Have the right to the full enjoyment of human rights and fundamental freedoms. Have the right to self-determination; to pursue their economic, social and cultural development. Of the Americas must, in the exercise of their rights, be free from discrimination of any kind. The Indigenous Rights Center is a charitable, religious and educational organization. Our purpose is to promote the wellbeing of Indigenous Peoples, and preserve and defend the rights and civil liberties of all Native Americans. Indigenous Rights Center (IRC) is happy to invite you to join our first meeting of the Diné Bizaad discussion and study group, created by Roberta Zayas, along with her family and friends. Whether you are fluent in the language or not at all, we encourage you to join our bi-weekly meeting. Roberta plans to keep this new program going as long as folks participate. 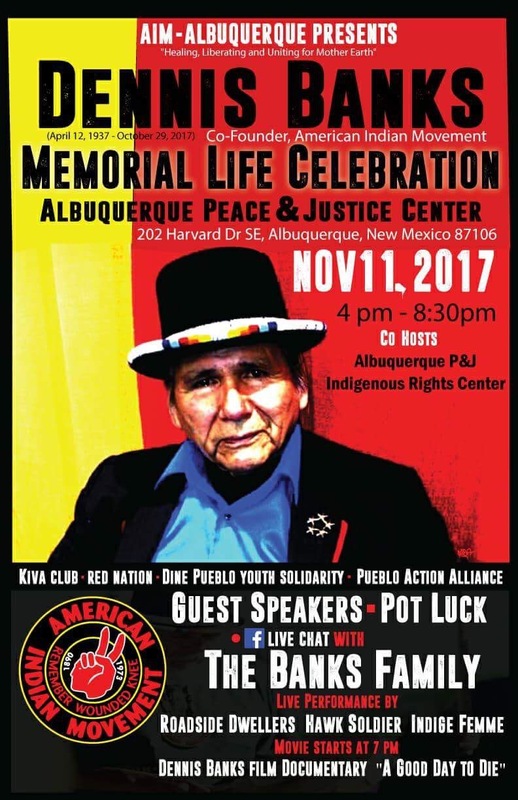 We will be using the Rosetta Stone as one language tool among others.The meeting will take place in the IRC office located in the SE corner of the Peace Center (202 Harvard Drive SE, #5, ABQ, NM). Doors might not open until just before 1pm. Just an FYI this group is to give native people — Diné people the opportunity in urban areas/border towns to learn their language and to create a community for fluent and nonfluent people to educate each other.Diné Bizaad Classes are normally expensive and inaccessible to all of our Diné relatives in Albuquerque so this is to create a space for people to learn/relearn/teach their language. The following is a partial list of the IRC’s activities in 2017. It is no secret that New Mexico has been and continues to be greatly impacted by every link of the nuclear fuel chain. The Nuclear Issues Study Group, founded in 2016, is a grassroots organization run entirely by volunteers and is based in Albuquerque, New Mexico. We meet regularly, and our membership comes from local New Mexico communities, including: organizers, young people, indigenous peoples, people of color, the LGBTQ community, students, artists, activists, and people who care about our water, lands, air, and public health. We work on several projects, as well as support local, statewide, and national campaigns to protect New Mexico from all things nuclear. As part of this effort, we are organizing a symposium titled “Dismantling the Nuclear Beast: Connecting Local Work to the National Movement”. The symposium will take place Friday, December 1st through Sunday, December 3rd, 2017 at the Hibben Center on the University of New Mexico campus in Albuquerque. From uranium mining and enrichment to weapons production and nuclear waste storage, we are quite literally in the “belly of the beast”. In order to make information accessible and to get others involved, we will have several presentations, panel discussions, and information tables focusing on all of these topics. We are inviting speakers from all over New Mexico and the country to share their stories, their work, and how we can take action to protect our environment and our communities! We will kick off our symposium with a special collaboration between NISG and the New Mexico Chapter of the National Association of Social Workers (NASW) on Friday afternoon. 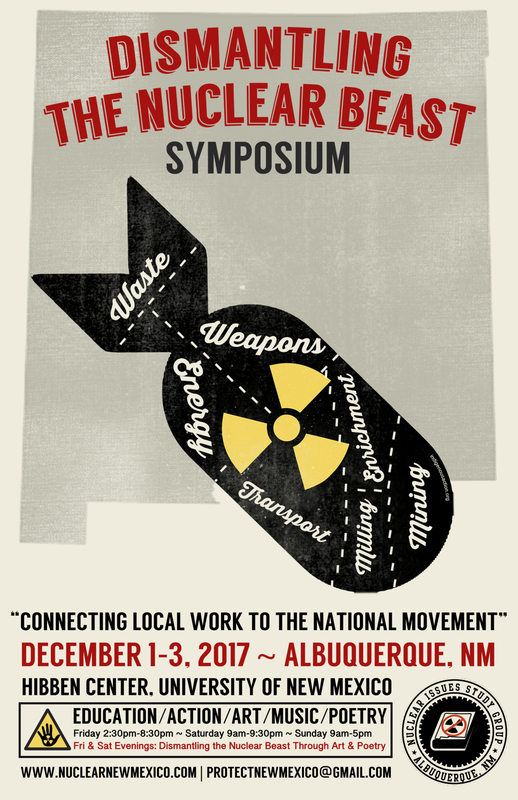 This opening workshop, dubbed “Environmental Justice: Nuclear Colonialism, Social Work, and Our Future in NM”, will provide an overview of the many nuclear sites in our state and make connections to the field of social work. Specifically, we will cover recent environmental justice issues specific to the misuse of water, natural resources, and sacred places, as well as the disproportionate occurrence of nuclear facilities in communities of color and lower socioeconomic status (SES). To wrap up this workshop, NASW NM will facilitate a discussion on the Social Work Code of Ethics, vulnerable populations, and paths to advocacy and action. If you are a social worker or student of social work, click here to register online with the NASW NM Chapter to obtain your continuing education units (CEUs). During the symposium, we will do our best to explore and expose every aspect of the nuclear fuel chain—past, current, and future—as well as highlight some key threats to New Mexico that NISG is focusing on including: Sandia National Laboratories’ Mixed Waste Landfill and the proposed Centralized “Interim” Storage of high-level radioactive waste. To equip attendees with tools to act on their increased knowledge about nuclearism & nuclear colonialism in positive, concrete ways and to get involved locally & nationally. In order to make this event a success, we are calling on you and our extended community to make a monetary donation to assist with the expenses of our symposium. Our fundraising goal is $5,000.00 and costs include: venue rental, speaker fees, travel, food & beverages, printing, and professional services. We are determined to minimize the expenses for this event by garnishing in-kind services and other donations, but still have quite a bit of funds to raise. Donate securely online directly to NISG via PayPal (credit, debit, PayPal). 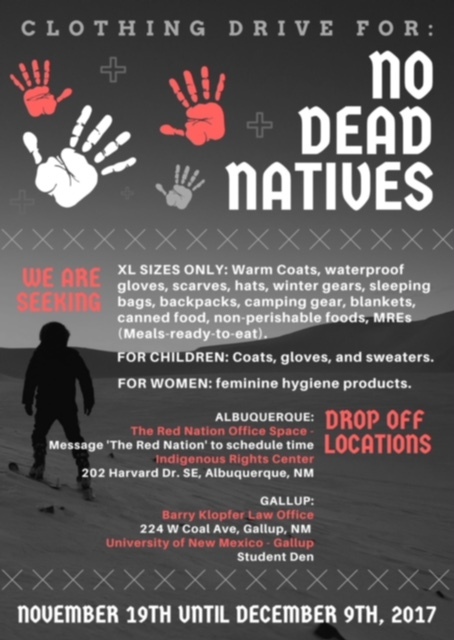 You may also mail or hand carry your donation to the Indigenous Rights Center mailbox, located inside the Albuquerque Center for Peace & Justice (SE corner of Harvard & Silver). You can also “Like Us” on Facebook. The following represents a partial list of the IRC’s activities in 2016.